Sigh. When books come in threes, and you read the first two, do you not feel honor bound to read the last one? I know I do – if I make it through two, I’m invested enough to want to see how things turn out. 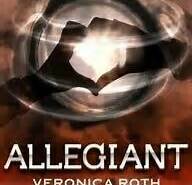 Sometimes I curse my own curiosity, for Allegiant is a most unsatisfying end to the Divergent/Insurgent experience. As with any third book in a trilogy, do not read this review if you haven’t read the first two books. It contains spoilers. Go over to Amazon and buy Divergent and Insurgent , then come back when you’ve finished. As we did when transitioning from book one to book two, Allegiant picks up immediately where Insurgent left off. Tobias has once again proven his trust in Tris and managed to release the information the Erudite were keeping secret to the entire city. As the factionless grab control at Erudite headquarters, every screen begins playing a video of a woman explaining how and why the city was formed. Apparently, in the outside world, failed genetic engineering led to widespread chaos and violence. The city was set up as a place for genetic healing, which would eventually provide genetically whole individuals who would then be tasked with helping the outside world. Those individuals are, you guessed it, the Divergent. Allegiant is the story of how the city reacts to this shocking revelation, as well as Tris and Tobias’s journey outside the city walls. Sounds great, right? Sadly, that would be wrong. One of the strengths of Divergent and Insurgent is the interesting world building by author Veronica Roth. Her creation of the faction system that allowed a person’s natural tendencies to flourish while keeping the peace with those of other ideologies is a fun and potentially endlessly complex way of examining real world social issues in her fictional context. In the first two books, it worked. In Allegiant she introduces an entirely new world into the mix, rendering her previous world moot and erasing two books worth of character development for Tris and Tobias. It’s one thing to have them travel outside the city, another altogether to have their world revealed as utterly false. We end up with little more than a very traditional Evil Government action story with little if any connection to the world in which we invested. We’re also dosed with an excess of existential angst and teen brooding. As the story gets thinner and less interesting, the characters seem to sense it and react by becoming pouty and insecure. It isn’t flattering. Tobias in particular fares badly – Four would never pout. I’m not even going to touch the ending. It’s just the final twist of the bad book knife. Roth also makes the decision to switch points of view between Tris and Tobias. We are told at the beginning of each chapter whose head we’re in, but these characters have not been given distinctive enough voices to allow for this sort of narrative see-saw. I was frequently pulled out of the story by the abrupt realization that I didn’t know who was talking. Overall, Allegiant is a major disappointment after the successes of Divergent and Insurgent. I still think the first two books are worth reading, but the third is a mess. The one positive is that it completes the story arc, there is no nebulous ending in which the reader must decide the fates of the characters (something I consider the hallmark of lazy storytelling). But the world building falls apart, the characters become unlikable and thin and the POV shift is disconcerting and poorly done. I’m torn about a recommendation – if you’ve read the first two and liked them you might as well go ahead and read it. It isn’t like it’s going to take long – all three books are fast reads. If you didn’t love Divergent, don’t bother going further. If you haven’t read any of them, go into it knowing that the first books are a lot of fun but don’t expect much from the conclusion. 2 stars out of 5.